Boy, was it chilly this morning when I got up. It was in the 40's. Fall has finally arrived for real. I had to put on pants today for the first time. Usually I try to wear shorts and flip-flops as long as possible. I still wore flip-flops, because I couldn't find any socks to put on in a hurry. I couldn't find Hunter's socks either. Guess I need to do some organizing of our clothes. I am ever the procrastinator! Today is the first day my husband has worked all week. It's been raining a lot! He works outside so, if the weather is bad, he doesn't get to work. And for the past few weeks we have had some rainy, wet, weather. I'm praying for dry days ahead, since he doesn't get paid if he can't work. I'm behind on visiting y'all because I helped my friend, Barb, set up a new recipe blog called The Homestead Table. She's going to put all her recipes online for safe-keeping. If you have any recipes would like to share, let her know. 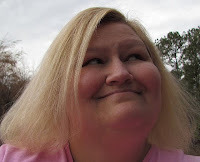 Carolina Mama has a great toy giveaway on her blog. Chilly here today too. I hear you about the rain-I've got an outdoor working husband too. It was much cooler here today plus we are having steady rain again. I hope it dries up and your husband gets back to work soon. Also, thanks for the links. I would have had my shoes on with or without socks. I can't stand for my feet to be cold. Loving this weather and this time of year.Sorry to hear your husband been out of work for this week. I will be praying for you guys. Oh Sweet Nancy I will send prayers up for you and your family. How aweful this must be for no work on rainy days. I can relate, my husband has been out of work for over three months now due to the economy out here, its a scary time. I will keep you in my prayers, and I am so happy to hear the rain lifted so that he could go in today. AMEN to that. Hope this day finds you well. It's a little cooler here today, but we have had 22 inches of rain in the past 20 days! It is crazy - our farmers are really suffering. Ooooh, I will have to check out the recipes! We might get snow tomorrow night. I am *really* not wanting the cold to start this early. It's gonna be a loooong winter. I need to dig out all our flannel pajamas. I haven't done that yet, either. I'll keep your family in my prayers, too. Have a good weekend! hmm, it was not as cold over here nearer to the coast. It rained here today, but it was a light rain. Oooo... The Homestead Table sounds like my kind of blog. I'm off to check it out... thanks! Also, I'm hoping the rain lets up for you guys. We have about four days of rain forecasted for us too. It's crazy! Nancy thank you for stopping over this evening and entering my giveaway. Have a great evening. Good thing you live where you do because if he can not work rainy days you would be very poor in Washington! What does he do? definitely chilly here too! and while i love flip-flop wearin', i must admit, i also really enjoy digging out the warm sweatshirts and slippers! :) good days for snuggling down and reading with the girlies for me...hope you and your guys have a great day...and praying for dry days! I just clicked on your link encouragement for the homeschool family conference. Uhhhhmmmmm, ATIA much? Don't worry that you do what you do, there is such a thing as TOO MUCH TIME WITH YOUR CHILDREN ya know? I think you are doing an excellent job, your kids seem well rounded and aware of others, and helpful at home. I really can't believe that curriculum is still going strong. There are MNAY of us kids who are the "survivors" of that brain washing and thank the Lord we turned out half-way normal, lol. Oh... I understand the whole, can't work in the rainy weather. Our newest son-in-law is in construction... he has had some 'days off' this week... sure hurts the wallet!! It's been freezing here too! It feels much more like winter than fall, and it bums me out. I'll be praying for dry weather for you, so your husband can work. I know it must be stressful for you. It has been chilly here too!! We have burned our fireplace the last 2 nights. I wanted it to cool off but not this much, hehe. Kathy, he works for a grading company. Sometimes they pave, sometimes grading.